In this Spring 2017 edition of our newsletter, we talk about how we’ve been named Manufacturer of the Year by Elektra. This is a huge honour, as the award celebrates the achievements of companies and individuals across Europe and recognises best practice within our fast-paced electronics industry. 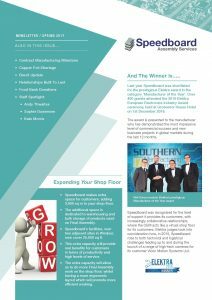 In this issue, find out about how we are expanding your shop floor and investing in our team, as we add 3,000 sq m of extra capacity and welcome three new members to the Speedboard team. You can read about how our industry is being impacted by the shortage of copper foil and how we reached a contract manufacturing milestone supplying JENOPTIK with its 2,000th VECTOR camera unit. All this and much more….